Yesterday morning I drove Brian out to the airstrip and watched him fly away. He went to the capital, Port Moresby, this morning, and then on Friday he will catch a flight to Buka. Buka is a small island that is just about as far east as you can go and still be in Papua New Guinea. 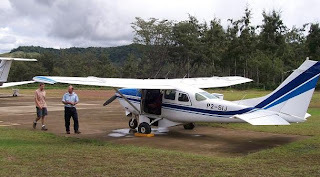 Brian had been excited about getting to fly on the King Air jet – the largest aircraft that SIL has here, but when we got to the airstrip we learned that since there were only two passengers, they decided to take the smaller Cessna 206 instead. That means the trip takes twice as long! Why is he going to Buka? There will be a two-week training course for national translators on the island, and they needed someone to manage the kitchen and make sure that everyone gets fed – so that is what Brian will be doing. He will supervise the two cooks and be in charge of driving into town to buy all of the food. He is very excited about the chance to see a new part of PNG and to be able to support the translation work in Buka. So I am home alone for two and a half weeks. I would have loved to go with him, but today the third module of the STEP literacy course started, and so I have a lot of work to do here. I sent the camera with Brian, so hopefully he comes back with some good photos and stories to share.